I made this cute card a while back, knowing that I would send it to one of my dear friends for a birthday. Well, I'm mailing it out today, and thought I'd better take a picture of it first! I paper-pieced the dress, meaning I stamped the image on patterned paper, cut it out and adhered it over the image stamped on the white cardstock. 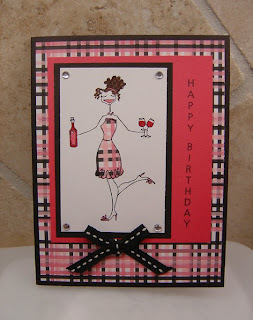 Stamps: Winobella (Stamping Bella), Happy Birthday (CTMH). Paper: Stylin' (CTMH-retired), Hollyhock cardstock (CTMH), Black cardstock (CTMH), White Daisy cardstock (CTMH). 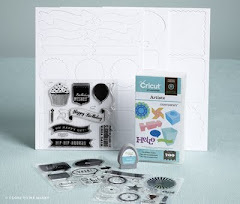 Embellishments: CTMH markers, Sparkles (CTMH), Black/white ribbon (CTMH).